The WB was a popular television channel once known for such cult shows as “Smallville” and “Buffy the Vampire Slayer”. If you were in your teens when these shows were in their golden ages (1990’s to early 2000’s), I’m certain you remember something about them. I myself had been an avid and loyal fan of the “Buffy” series, and unfortunately had very little interest in any of the others. Recently however, despite now being in my mid-twenties, my husband and I have been sitting down together each evening to watch a couple of episodes of another of the cult hits “Roswell”. I have to admit, it is a fantastic very well done, tv show which I genuinely enjoy. Since I’ve always been very curious in all things involving extraterrestrials, it’s no surprise that “Roswell” sparked my interest to do some research on the real story of Roswell’s alleged alien spaceship crash, since it had been several years since I’d visited the story. It’s true that there have been a few whistle blowers who have courageously come forward to share information involving extraterrestrials, and some have said that certain episodes of shows such as “X-files” and “V” actually hold some truth, although which episodes in particular is still a secret. It’s disinformation as it’s finest, in my opinion. Although it’s very unlikely that the “Roswell” series holds any truth, I decided to once again research the real story from the beginning. The event took place during the first week of July in the year 1947 in Roswell, New Mexico. One fact we might all agree upon is that something did occur that day. The military was called in to clean whatever it was up and although there are testimonies from members of that clean-up who insist nothing extraterrestrial was recovered that day, would anyone really expect otherwise regardless of the truth? On January 12th, 1994m US congressman Steveb Schiff of Albuquerque, NM announced that the defense department had adamantly refused to hand over to him information regarding Roswell, which he had requested on behalf of the constituents and witnesses of that day. The congressman called this behavior from the defense department “astounding” and concluded it to be an indication of yet another coverup by the government. If a tweaking hobo is seen rambling about UFOs or ETs, nobody pays any attention, but what about when a credible witness, someone who could be a trusted nextdoor neighbor, your child’s lifelong nanny or schoolteacher, perhaps being yourself, insists without a doubt that they saw a flying saucer or unidentitified aircract of some sort? Even newspapers resport sightings of UFOs, not just in New Mexico, but all over the planet as a whole. Throughout documented history, people have witnessed UFOs. The famous painting, “The Madonna with Saint Giovannino ” by Domenico Ghirlandaio amazingly depicts what appears to be a flying saucer in the 5th century! Military personell, such as colonel William Blanchard, of the 509th bomb group from Roswell, was convinvced that the weather balloon press release from eighth Air Force headquarters in Ft, Worth, TX, was a “hastily contrived story”. Those who know Colonel Blanchard personally describe him as a no-nonsense business minded individual, not one to fabricate such a story. 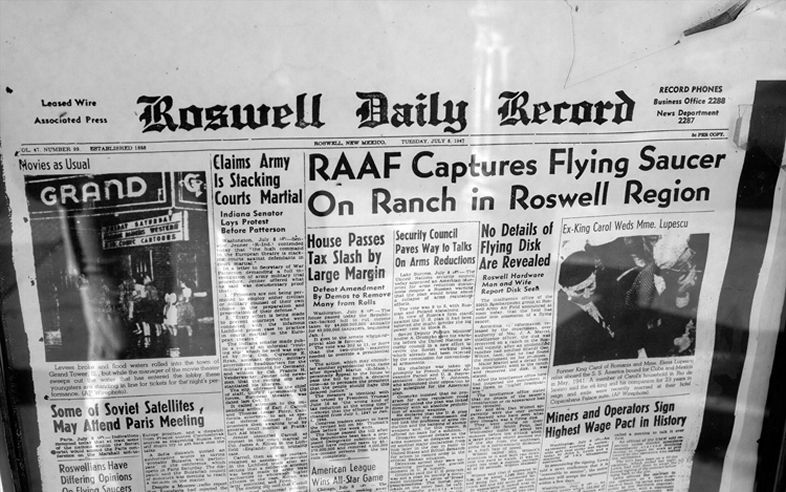 There exists dozens of stories just like that of Colonel Blanchard, from very sane, even once skeptical people, who support the likelihood of a government coverup regarding the Roswell crash in 1947. The evidence comes and goes and by today we’ve probably been fed so much disinformation that picking the truth from all the lies would be like discovering a needle in a hay stack. Even if the truth is right before our eyes, only those who were there and saw for themselves will know the truth. Posted by Denna Holm on March 21, 2013 in Archives and tagged aliens, Buffy, Rosswell, smallville, UFO, vampire.